There will be an opportunity for questions from the floor. The full text of the questions ARAG has candidates to answer, and background information ARAG has provided to candidates, is as follows. Context – ARAG and FOE members have real concerns about WestConnex given the lack of transparency, accountability, environmental impact studies, poor community engagement & focus on roads rather than integrated public transport. 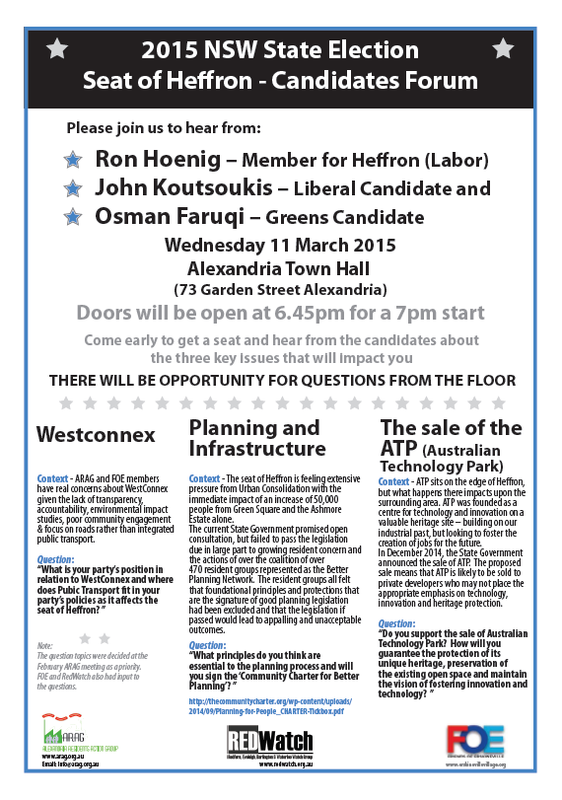 Context – the ATP sits on the edge of Heffron, but what happens there impacts upon the surrounding area. ATP was founded as a centre for technology and innovation on a valuable heritage site – building on our industrial past, but looking to foster the creation of jobs for the future. In December 2014, the State Government announced the sale of ATP. The proposed sale means that ATP is likely to be sold to private developers who may not place the appropriate emphasis on technology, innovation and heritage protection. Context – The seat of Heffron is feeling extensive pressure from Urban Consolidation with the immediate impact of an increase of 50,000 people from Green Square & the Ashmore Estate alone. The current State Government promised open consultation, but failed to pass the legislation due in large part to growing resident concerns and the actions of a coalition of over 470 resident groups represented as the Better Planning Network. The resident groups all felt that foundational principles and protections that are the signature of good planning legislation had been excluded and that the legislation if passed would lead to appalling & unacceptable outcomes. Edit: John Koutsoukis has had to withdraw owing to work commitments.